Voter Registration Deadline The voter registration deadline is always 15 days before an election. However, please be advised that voters who register after the 29th day before an election will not receive a sample ballot or other election information by mail. Permissible Uses of Voter Information (Elections Code §2157.2)Information on your voter registration affidavit will be used by elections officials to send you official information on the voting process, such as the location of your polling place and the issues and candidates that will appear on the ballot. Commercial use of voter registration information is prohibited by law and is a misdemeanor. Voter information may be provided to a candidate for office, a ballot measure committee, or other person for election, scholarly, journalistic, political, or governmental purposes, as determined by the Secretary of State. Driver’s license and social security numbers, or your signature as shown on your voter registration card, cannot be released for these purposes. If you have any questions about the use of voter information or wish to report suspected misuse of such information, please call the Secretary of State’s Voter Protection and Assistance Hotline (800) 345-VOTE begin_of_the_skype_highlighting (800) 345-VOTE end_of_the_skype_highlighting or (916) 657-2166 begin_of_the_skype_highlighting (916) 657-2166 end_of_the_skype_highlighting. Certain voters facing life-threatening situations may qualify for confidential voter status. For more information, please contact the Secretary of State’s Safe At Home program or visit the Secretary of State’s Web site at http://www.sos.ca.gov/safeathome. Remember: In California, the deadline to register to vote for an election is 15 days before each local and statewide election day. If you register 29 days or less before an election, you will only receive a Voter Notification Card showing you are registered and telling you where to vote — you will not receive a Sample Ballot or, for a statewide election, a State Voter Pamphlet — so register early! Registration forms should be available at all post offices, many city clerk offices, libraries, the Department of Motor Vehicles, and County departments. Call us and we will send you one. You can visit or call the Election Office. Our hours are 8:30 a.m. to noon and 1 p.m. to 5 p.m., Monday through Friday. In California, If you are on probation, you CAN vote. If you are houseless, you CAN vote. Someone without a “residential address” simply registers by describing a street corner in the area where they are living (for example, NE corner of J and 8th), then provides a mailing address. People circulating the Eureka Fair Wage Act can also help you register to vote. 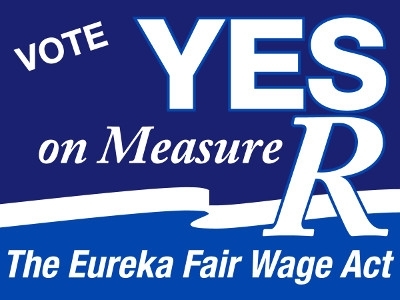 To sign the Eureka Fair Wage Act petition, you have to already be registered to vote, or register at the same time as signing. You also need to live where you are able to vote for the Eureka city politicians and city propositions.